Background One common model utilized to understand clinical staff and patients' technology adoption is the technology acceptance model (TAM). 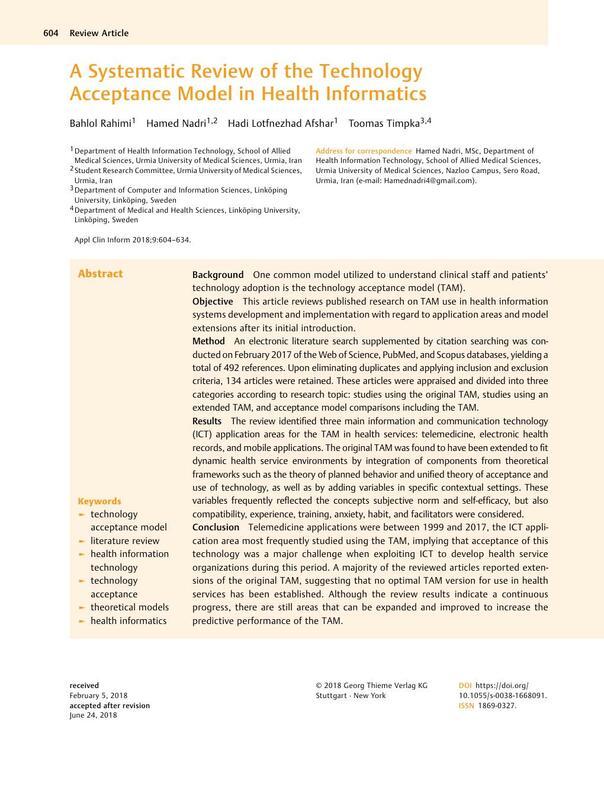 Objective This article reviews published research on TAM use in health information systems development and implementation with regard to application areas and model extensions after its initial introduction. Method An electronic literature search supplemented by citation searching was conducted on February 2017 of the Web of Science, PubMed, and Scopus databases, yielding a total of 492 references. Upon eliminating duplicates and applying inclusion and exclusion criteria, 134 articles were retained. These articles were appraised and divided into three categories according to research topic: studies using the original TAM, studies using an extended TAM, and acceptance model comparisons including the TAM. Results The review identified three main information and communication technology (ICT) application areas for the TAM in health services: telemedicine, electronic health records, and mobile applications. The original TAM was found to have been extended to fit dynamic health service environments by integration of components from theoretical frameworks such as the theory of planned behavior and unified theory of acceptance and use of technology, as well as by adding variables in specific contextual settings. These variables frequently reflected the concepts subjective norm and self-efficacy, but also compatibility, experience, training, anxiety, habit, and facilitators were considered. Conclusion Telemedicine applications were between 1999 and 2017, the ICT application area most frequently studied using the TAM, implying that acceptance of this technology was a major challenge when exploiting ICT to develop health service organizations during this period. A majority of the reviewed articles reported extensions of the original TAM, suggesting that no optimal TAM version for use in health services has been established. Although the review results indicate a continuous progress, there are still areas that can be expanded and improved to increase the predictive performance of the TAM.